On September 21, 2014, over 300,000 people moved through the streets of Manhattan for the People’s Climate March. Walking with members of Superhero Clubhouse, I quickly found myself surrounded by an incredibly diverse crowd of participants. According to organizers of the event, members attended from over 1,500 organizations from labor unions, to religious and cultural groups, to universities, not to mention the hundreds who marched without an affiliation other than as a citizen of Earth. On the march, I was also welcomed by the faces of scores of fellow independent theatre artists. When it comes to climate change, everyone is a stakeholder with a responsibility to take action. As the event’s slogan aptly put it: “To change everything, we need everyone.” It made me reflect deeply on what artists can bring to the table. How can theatre play a larger role in the societal conversation about the environment? How might green theatre practices serve to not only reduce the field’s impact on the environment, but also connect artists and build community in NYC? In her recent article, “Art and Climate Change - Inspiring a Sustainable Future,” Ellen Moyer explains succinctly why the arts are vital in our conversations about environmental uncertainty. She posits that “art allows people to relate to vast and often unfathomable concepts by engaging the heart and the senses.” The arts in general, and theatre in particular, have the power to put a human face on scientific data and arouse empathy and understanding in spectators. Stories on stage can communicate the dizzying expanse of environmental problems along with the social and economic complexities that are inextricably linked to them. Plays about climate change told through personal human stories have made their way to theaters across the city in recent years, including This Clement World by Cynthia Hopkins at St. Ann’s Warehouse in 2013, The Great Immensity by The Civilians at The Public last year, and the Big Green Theater Festival at the Bushwick Starr which celebrates its 5th year presenting student-written eco-plays at the end of this month (just to name a few). While conversations about environmental concerns populate our stages, independent theatre artists are also doing work backstage to lead the charge in reducing waste and implementing green theatre practices. In New York City, theatre artists have been subsisting on dreams and shoe-string budgets for decades. If necessity is considered the mother of invention, limitation, though usually cast in the role of evil step-mother, should also get credit for inspiring creativity. Artists rightfully bemoan the lack of time, money, space, and resources available, but these limitations have, in part, challenged them to be innovative. Tricks of the financially-strapped artist's trade already included recycling, thrifting, and dumpster diving for materials before those things were considered green, let alone trendy. Recognizing the need to organize this effective use of resource sharing, theatre artists created The Shared Independent Theatre (S.H.I.T) List. The S.H.I.T List provides a web-based platform for independent theatre and film makers in the NYC area to sell, rent, borrow, or trade set pieces, props, costumes, and other material goods. The brainchild of members of Gideon Productions, Flux Theatre Ensemble, and Shaun Bennet Fauntleroy, the S.H.I.T List received funding from the League of Independent Theater. For small companies with a limited budget and little to no storage space, The S.H.I.T List provides an excellent option for acquiring and discarding resources economically while reducing waste. Unlike Craigslist or Freecycle (though also great resources to recycle materials) the S.H.I.T. list is tailored to the strange and specific needs of theatre makers who just might need mannequin heads for wigs, LED lights, or a hot pink bird cage on the cheap. Independent theatre artists are also receiving support from larger advocacy organizations. The Broadway Green Alliance (BGA), already an active champion of environmentally friendly theatre initiatives, has extended its reach by creating the Off-Broadway Green Alliance to focus on the specific challenges artists face working beyond the Great White Way. BGA recently announced it will provide small grants to Off-Broadway venues or companies to help them start greening programs. Artists can also become Green Captains and receive tips and resources to support green practices, including information on coordinated recycling (paper, textiles, electronics). Simply having a designated Green Captain in the room can help organically raise awareness amongst cast and crew.The Off-Broadway Green Alliance, recognizing the importance of idea sharing, hosted its first event last month, Off-Broadway Green: A Conversation about Greener Theatre, which gave artists a chance to present challenges, successes, and best practices. Sharing dialogue through panel discussions and events with both artists and audiences serves to position green theatre initiatives in the larger framework of society’s response to climate change. Two upcoming panels will touch directly on the impact independent artists can achieve while bringing in the perspectives of scientists and society leaders. Indie Green: A Conversation about Ecological Practices and Values within the NYC Independent Theater Community, is hosted by Superhero Clubhouse, in partnership with The League of Independent Theater and the Broadway Green Alliance. The event will present a group of panelists with diverse expertise pertaining to green practices in the theatre and beyond who will discuss the continuous exchange between art making and society at large. The format of the program invites panelists and attendees alike to share resources and ask questions to create an open forum of learning and sharing. The Foundry Theatre, a company known for tackling complex contemporary social and political issues, regularly presents panel discussions, called The Foundry Dialogues, designed to engage both artists and community members. Their next discussion, This Changes Everything, takes its title and inspiration from Naomi Klein’s bestseller about climate change. The event will feature journalists, policy makers, artists, and activists as they explore the impact of climate change on the micro (the body and the local community) and the macro (the country and the planet) and the ways in which people adapt. As environmental sustainability comes to the forefront of society’s conversations, theatre artists are uniquely positioned to engage thoughtfully with ecological issues in performance, in the creation of the work, and by generating dialogue between diverse communities. The mission of this blog is to continue those conversations online and highlight how independent theatre artists are tackling environmental concerns onstage while greening their creative processes offstage. By sharing our struggles and triumphs, we might better innovate and push the boundaries of what constitutes eco-theatre. 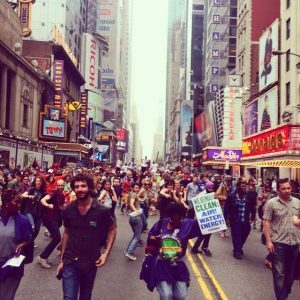 Walking to the People’s Climate March last September, I remember feeling skeptical about whether my presence mattered and wondered if one more body walking in the street could make any difference. Sometimes that same sentiment can creep into discussions of whether green theatre practices are just a drop in the bucket when it comes to the immensity of climate change and ecological uncertainty. Yet, theatre artists know better than anyone the power of collective collaboration. When it comes to the independent artist community in NYC, we are our own best renewable resource. Sharing ideas, innovations, materials, conversations, and supporting each other’s evolving green processes brings the community together and ensures we can continue to create art that will vitally shape the artistic, cultural, and environmental landscape of NYC. Megan McClain is the Resident Dramaturg for Superhero Clubhouse and the Literary Associate for the Civilians. She also works at Lark Play Development Center and holds an M.F.A in Dramaturgy from the University of Massachusetts at Amherst.